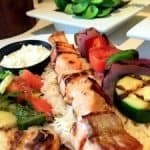 What Makes Cafesano A Unique Restaurant in Dulles Town Center? With the wide variety of restaurants in Dulles Town Center, Virginia, it can be difficult to decide where you want to eat. However, not every restaurant is different. Many seem to offer basically the same food, the same experience, the same everything. Which kind of takes the excitement out of dining out, doesn’t it? When you decide to eat out at a restaurant, you are looking for an opportunity to relax, unwind, have fun, and eat great food, all in a great atmosphere. And, you are looking for a unique experience. When you eat at Cafesano in Dulles Town Center, you will get all of that! Our menu at Cafesano is different from any other restaurant in Dulles Town Center or even Sterling. We have created a menu that offers the best in both Italian food and Mediterranean food to create a dining experience you’ve never enjoyed anywhere else. The food we serve is never too rich or spicy but, instead, is food that you can eat two, three and more times a week. It’s light, it’s flavorful, it’s healthy and it tastes great! Our Mediterranean dishes include our very popular Hummus, a Chicken Shawarma Wrap and several Kabob platters. Flavorful Panini sandwiches, Fettuccini Alfredo (and other pasta dishes) and our unique Brick Oven pizzas are among our favorite Italian menu items. Add a Kids menu, a wide selection of beverages (wine and beer included), dessert options and you’ve got something for everyone at Cafesano. 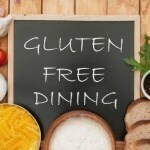 The wide variety of foods we offer makes our menu larger and much more diverse than other quick casual restaurants. And, did we mention that much of what t we offer is healthy? 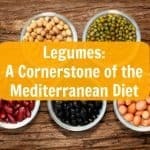 In fact, the Mediterranean Diet is one of the healthiest diets in the world. 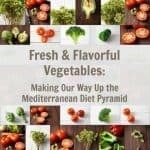 We use only the freshest vegetables, whole grains, lean meats and healthy fats – including lots of olive oil. Add in lots of fresh herbs and spices and you have a menu that full of flavorful, made-to-order dishes inspired by Italian and Mediterranean recipes. The diversity of our menu, with almost all items “made-to-order,” combined with the number of healthy options is unparalleled in other fast casual restaurants in Reston, VA. Many fast-casual restaurants aren’t especially warm and inviting since they focus more on getting guests in and out. We understand the importance of a dining environment, whether you’re staying for 10 minutes or two hours, and have worked to create an atmosphere in our restaurants that is warm and welcoming to our guests. Here are a few things we do to ensure your dining experience is a memorable one. Our lighting is natural and bright — no fluorescents to blind you here. At nighttime, we turn down the lights and bring out the candles. This creates an inviting and warm environment. No matter what time of day you’re in Cafesano, you’ll notice how the lighting makes a difference in your experience. Our restaurant offers diners plenty of space to enjoy their meal. Even when Cafesano is packed during a busy lunch or dinner hour, you will not be scrunched in next to someone else. Even the stools at the bar are spread out enough so you’re not invading someone’s personal space. Counter seating. If you don’t have enough time to sit and enjoy your meal in our restaurant, you can at least enjoy waiting for your to-go order at Cafesano. We offer counter seating that has plug-ins for laptops and phones, so you can recharge and get some work done while you’re waiting for your order. Or, if you prefer, you can wait in our to-go order dedicated seating area for extra comfort. Interior design. The decor at our restaurant in Reston is the perfect mix of modern and classic. Between the reclaimed wood, the partially-open kitchen, the brick pizza oven, and more, you will feel welcome at Cafesano, and fall in love with your surroundings. Our fast-casual dining experience makes sure that your meal is delivered to you quickly, but not so fast that you feel rushed to eat in a hurry and leave. Our approach to dining allows you to truly savor and enjoy your food. Outdoor dining. 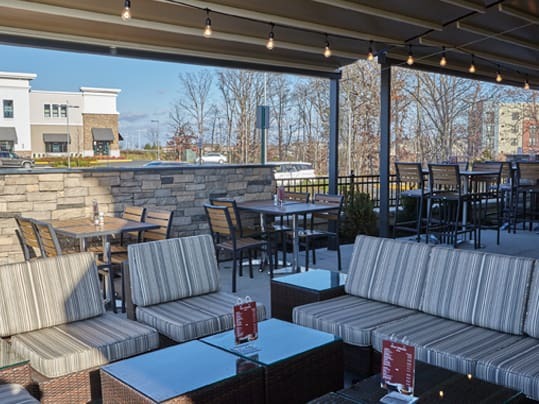 Our Dulles Town Center restaurant offers the option to dine on our beautiful outdoor patio. There are two fire pits outside that provide great warmth and comfort, and the walk-up window to the bar makes getting a drink outside fun and easy. Our priority is to ensure you feel comfortable while dining at Cafesano. With the way that we have structured our dining space and your dining experience, we know you’ll feel completely comfortable, and have a great time. Typically in fast-casual restaurants you have to pick up your food from the counter when it’s ready. However, at Cafesano, we deliver the food right to your table. We want you to start relaxing as soon as you walk through our doors. And, by bringing your food to you, you can do just that and not have to worry about when your name will be called or when your buzzer will go off. Some days call for a glass of good wine or beer and when those days happen, Cafesano has you covered. We offer beer and wine at both our Reston restaurant and our Dulles Town Center restaurant for patrons to enjoy alongside their tasty meal. 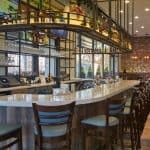 At our Dulles Town Center location, we also offer cocktails and have a bar area with big screen TVs where you can take in your favorite sports event or catch breaking news. 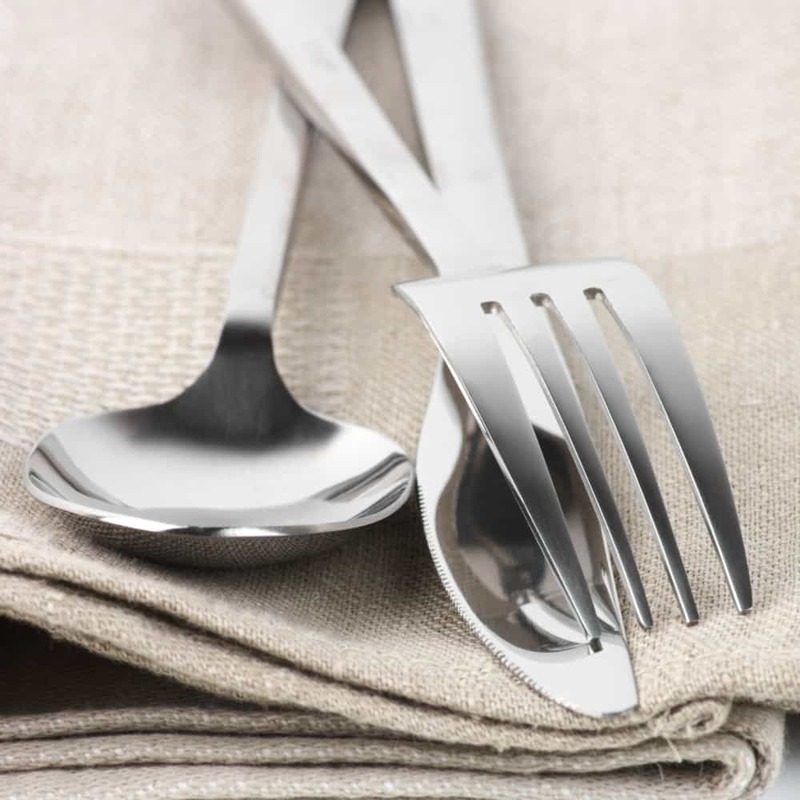 Many restaurants serving people on-the-go or those who are looking for a fast-casual experience opt for plastic utensils and disposable dishes. We’ve stepped it up and choose to use standard flatware. It goes back to that dining “experience” thing – we don’t want plastic utensils breaking in the middle of your meal and we also don’t want you cutting through a disposable plate or bowl! 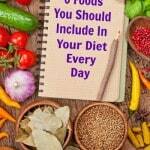 We want you focused on the food – not the utensils! And we promise – you’ll be sure to taste the difference! So if you’re looking for a unique and special dining experience that will satisfy not only your taste buds but all your senses, be sure to visit Cafesano. 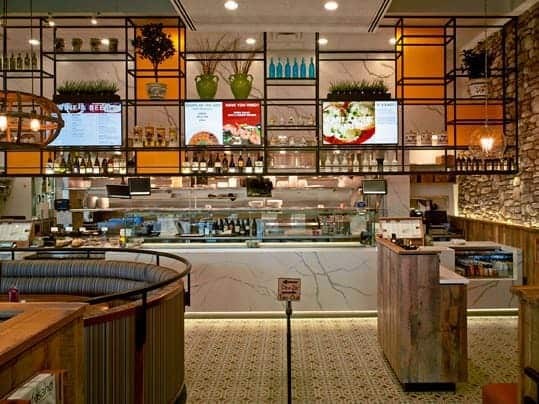 Both our Reston and Dulles Town Center locations offer the best food, the best customer service, and the best environment to ensure that you do, indeed, have a memorable dining experience. This entry was posted in Fast Casual Restaurants, Healthy Dining in Northern Virginia, Northern Virginia's Best Restaurants by Cafesano. Bookmark the permalink. Cafesano is indeed a unique restaurant and really like it a lot. They offer the best coffee you can ever have.